Another week of my Couch25k complete and yet again I am incredibly proud of myself. This week has consisted of 90 seconds of running followed by 2 minutes of walking for 20 minutes. At the start of the week I wasn’t sure if I would be able to manage the extra 30 seconds of running but my first 90 second run passed really quickly once I got my head down and started concentrating on my music. It also helped that I was going downhill! By the end of my first longer run, I didn’t feel too bad. It gave me real confidence and made me think I’m not quite as unfit as I thought! On my second run of the week I ventured a bit further and headed for the main road. I’ve been avoiding inflicting my running on the general public too much as I think I run a little bit like Phoebe from Friends! If you’re a Friends fan, you’ll know the episode and why I’ve mainly been running around our dark estate! But, my confidence is growing and I thought I’d go for it. My final run of the week was hard. Much harder than it has been all week as I had a head on wind for the homeward stretch and it really took it out of me. I admit that I did have to end 2 of the running sections slightly early but I still managed to take nearly 20 seconds/km off my best pace. I must have been flying! 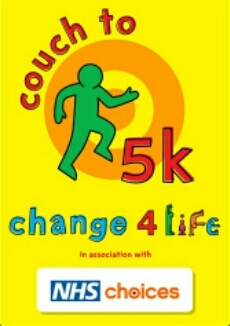 This week I have signed myself up for my first 5k race. It’s in July so I have plenty of time to prepare for it and it’s the Cancer Research Race For Life so hardly competitive. I wanted to set myself a goal so I had something to work towards and feel like my all my hard work isn’t for nothing. Next week is going to be really hard. This isn’t meant to be easy so I’m sure I’m probably going to say that every week! Next week is repetitions of 90 seconds running, 90 seconds walking, 3 minutes running and 3 minutes walking. Those 3 minutes of running are really going to test me as it’s doubling my running time! I also need some new music for next week as I’m getting a bit bored of the same old 30 minute continuous mix. If anyone has any suggestions, I’d be grateful.